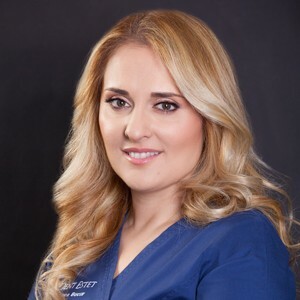 Dr. Raluca Bucur has been part of the DENT ESTET Dental and Facial Aesthetics team since January 2008. In recent years, Dr. Raluca Bucur has focused on Dental and Facial Aesthetics, aiming at providing simple and effective solutions for patients rejuvenation. She took part in events dedicated to worldwide specialists, obtaining multiple certifications in the latest aesthetic techniques. In the Greater New York Dental Meeting 2010, she certified for “Cosmetic Derma Fillers”, as part of the first team of Romanian dentists to be specialized in Botox Cosmetic and hyaluronic acid procedures. Dr. Raluca Bucur is also one of the few certified LUMINEERS® professionals in Romania.